Current Roman Catholic Bishop, Francis Alleyne said his predecessor died at about 5:30 AM. He was hospitalised for about one week. 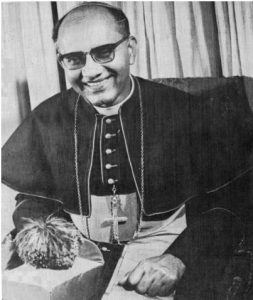 Singh retired in 2004 and was succeeded by Trinidadian, Bishop Alleyne who hailed Bishop Singh’s contribution to the church and Guyana generally. “Stepping into his shoes, you realise the stature of the man, holding that post of leadership in the time that he did. He was in office for thirty-three years… that era and I think he really did a tremendous task as a figure of stability and a moral presence,” Bishop Alleyne told Demerara Waves Online News. At that time, the Roman Catholic and Anglican Churches had often let their voices known during that period of serious political and economic turbulence. Monsignor Terrence Montrose, who was ordained by Bishop Singh, also reflected on the life of Bishop Singh, saying that his passing “would be a great loss because he had inspired a lot of people, did a lot of work and very quiet man”. “We were friends. I could have spoken with him anytime and he always listened and he helped where he can so for me it’s a great loss. When I went to the hospital this morning, I was so disappointed I wasn’t in time to pray with him but I went to the hospital every morning to pray with him and to read for him so for me it is very sad,” said Father Montrose.